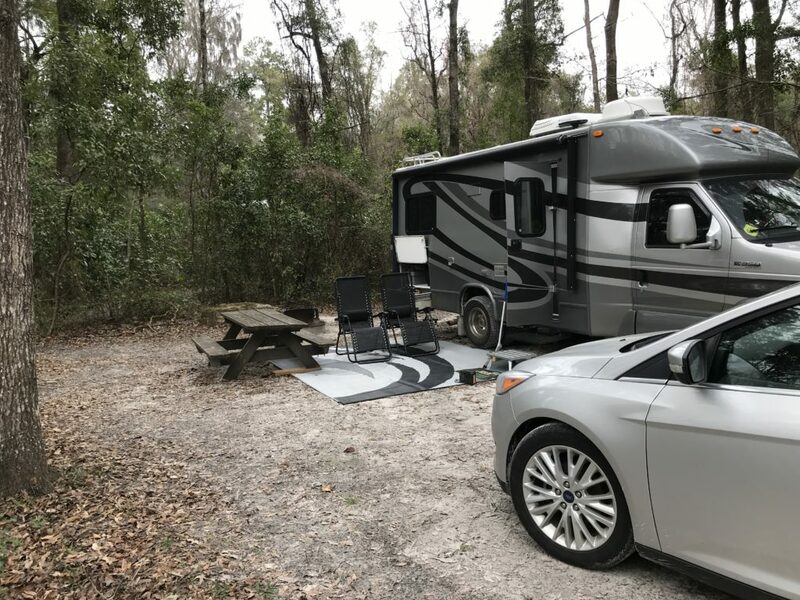 We like to visit and camp in as many of the Florida state parks whenever we get the opportunity. 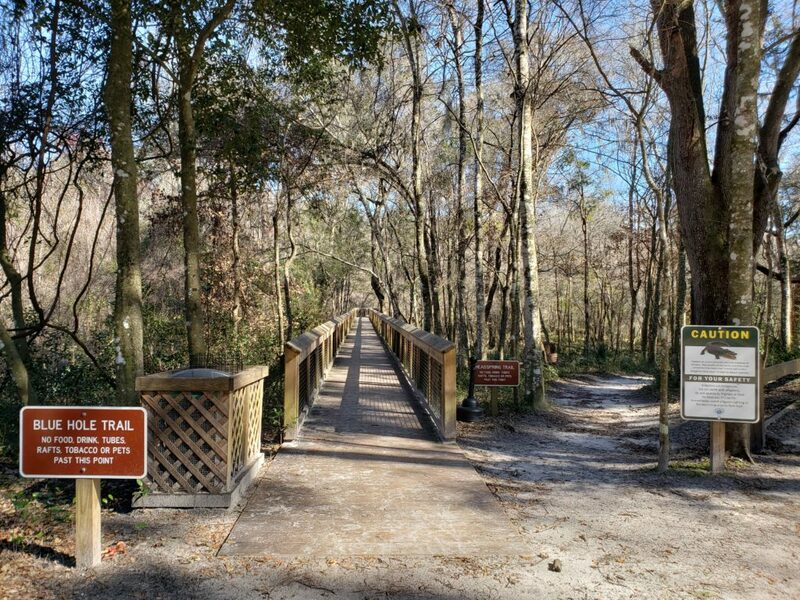 The Florida state parks are heavily booked and we were lucky that an opening came up. 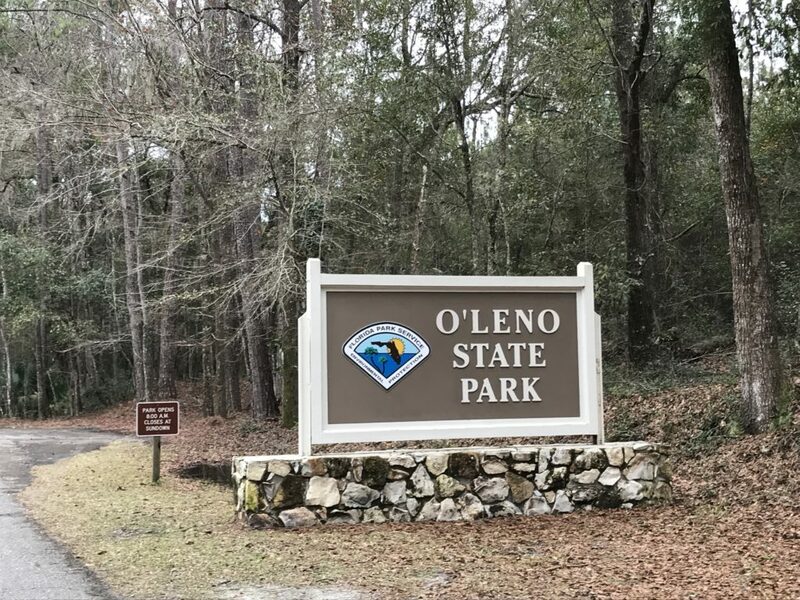 We camped at O’leno State park for 5 days. O’leno is located in north central Florida. Although the weather was cool in the 50’s and 60’s, we were happy to be out of the frigid weather in Pennsylvania. O’leno is known for the Santa Fe River’s unique disappearance and re-emergence 3 miles away at River Rise State Park. 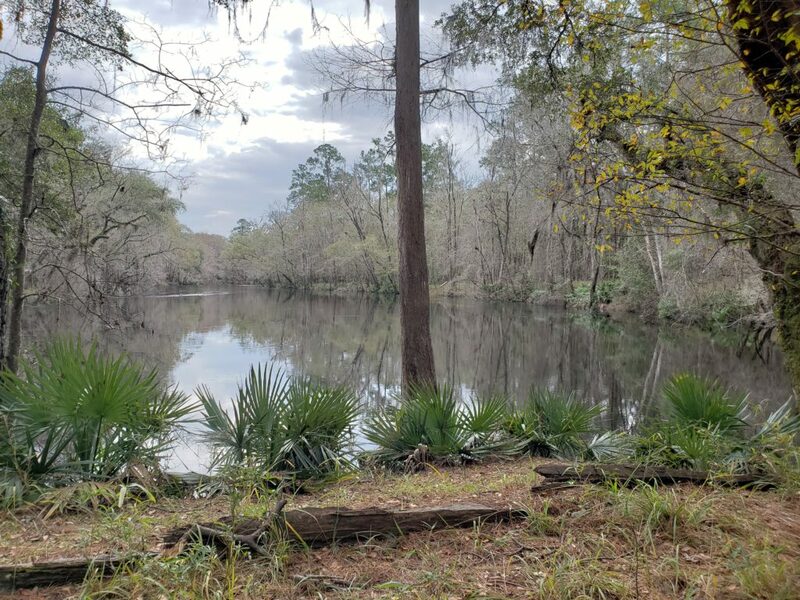 The Santa Fe River is a tributary of the Suwannee River which we visited last year. The campground sites were very rustic. This was a pretty rock formation at the entrance to the campground. The Santa Fe river has flooded numerous times over the years. 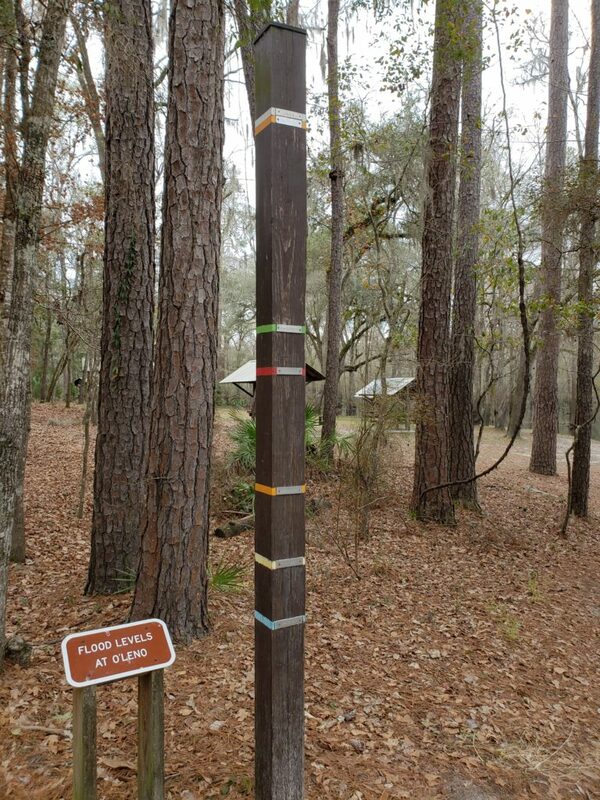 This marker indicates the flood levels. The water was high when we were there, but no where near record levels! The two areas are known as the River Sink and the River Rise. This video shows the end of the river before it sinks underground for 3 miles. The water swirls down into limestone caves. The early settlers actually were able to cross the river over the land bridge. It was a 3 mile hike to see the river rise. Unlike the River Sink, the River Rise was calm. We sat and had a picnic before heading back to the car. It was a nice day! 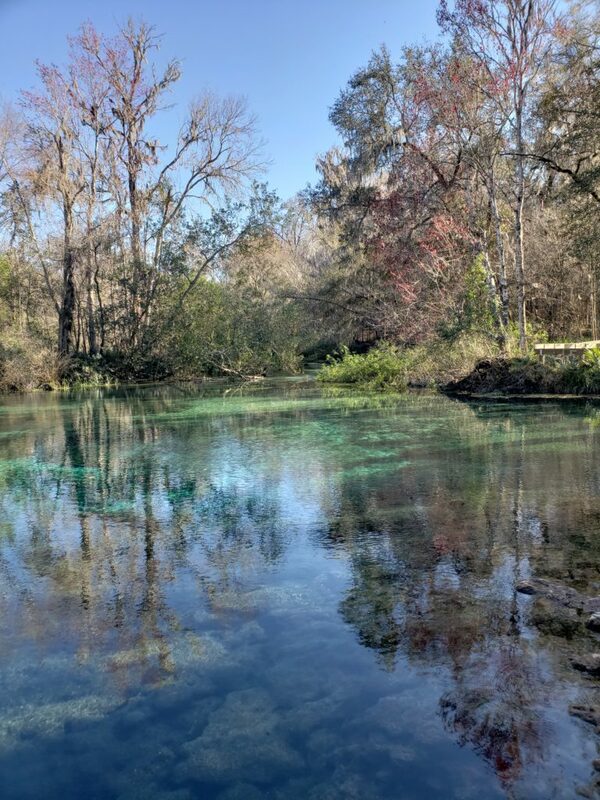 We took a day trip to Ichetucknee Springs State Park. It was a very nice park and was beautiful. 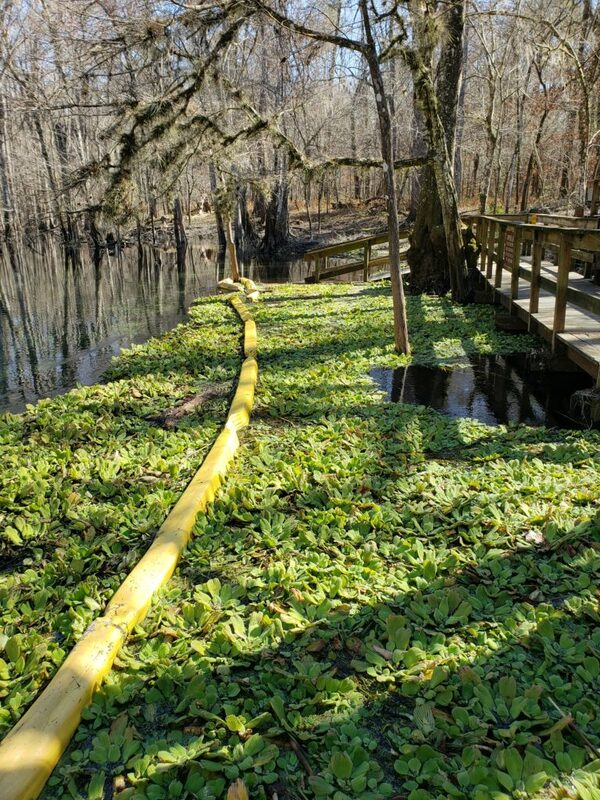 The main activity here is tubing down the Ichetucknee River. 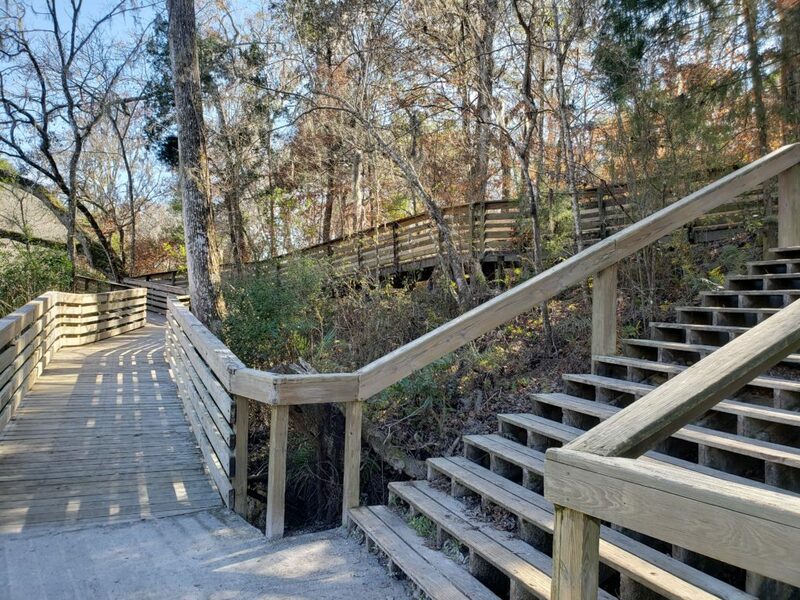 There are two entrances to the park – if you want to tube or kayak, enter at the north entrance. At this park there was a really nice spring called Blue Hole. 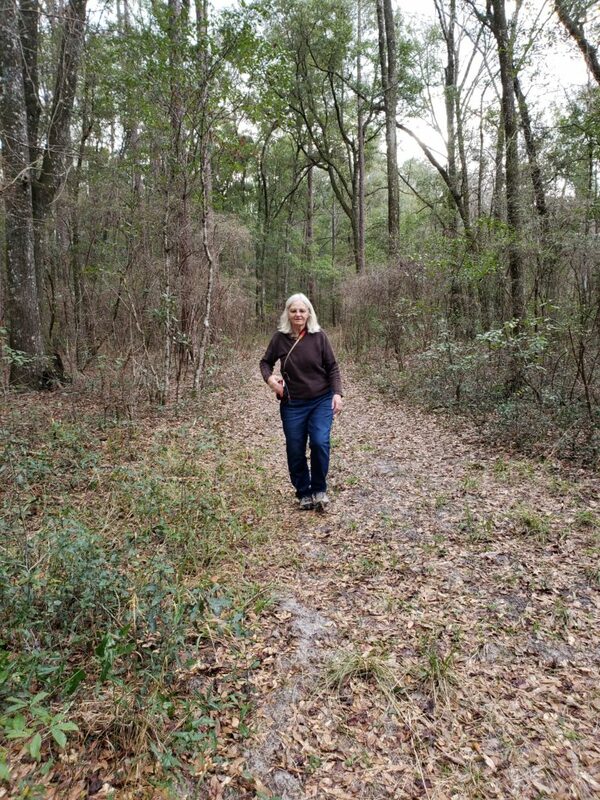 We took a couple of hikes here and really liked the trails. 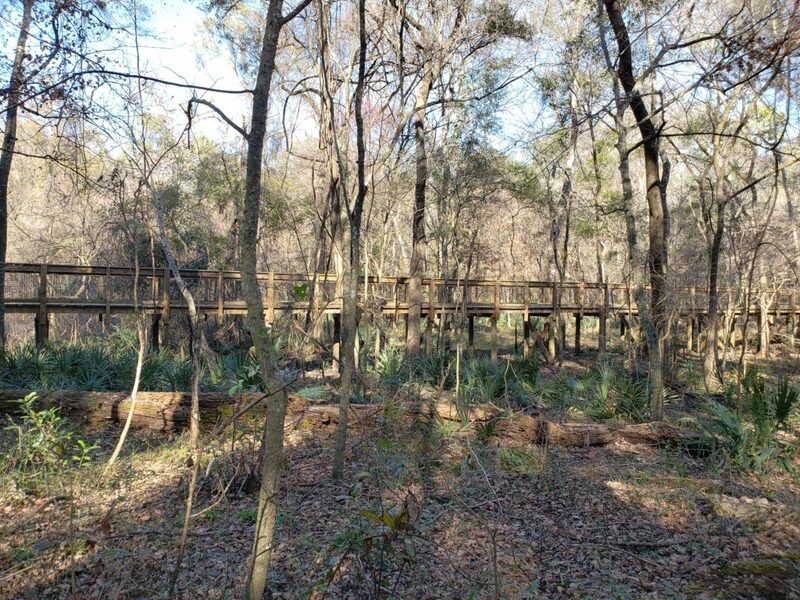 The hike to Blue Hole was along boardwalks and sandy paths. 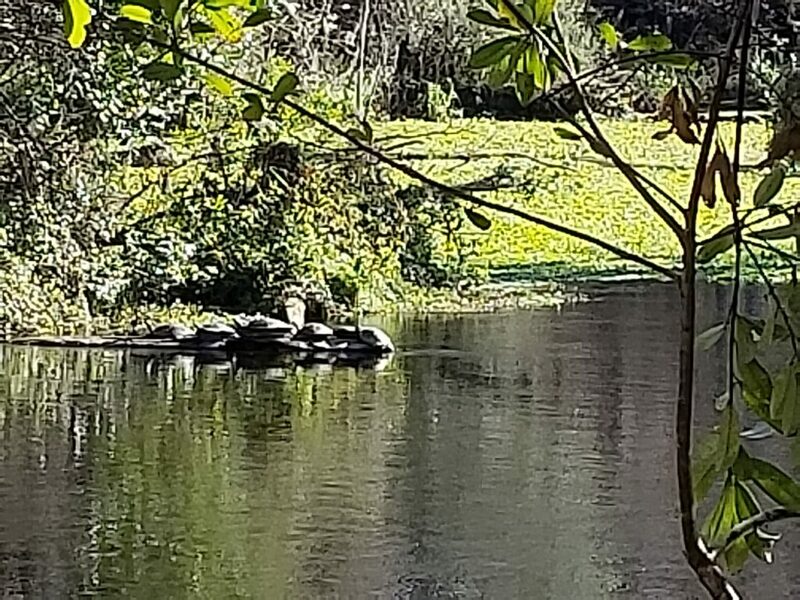 It was exciting to see these turtles sunning on a log. The southern entrance had a beautiful area to end the tubing or kayak ride with a general store and walkways. There was a lot of vegetation and we saw lots of fish in the clear water. There was lush vegetation in the water even though most of the leaves were off the trees. Heavy vegetation growing on the water was interesting. We had reservations for Gilchrist Blue Springs State Park for two nights. 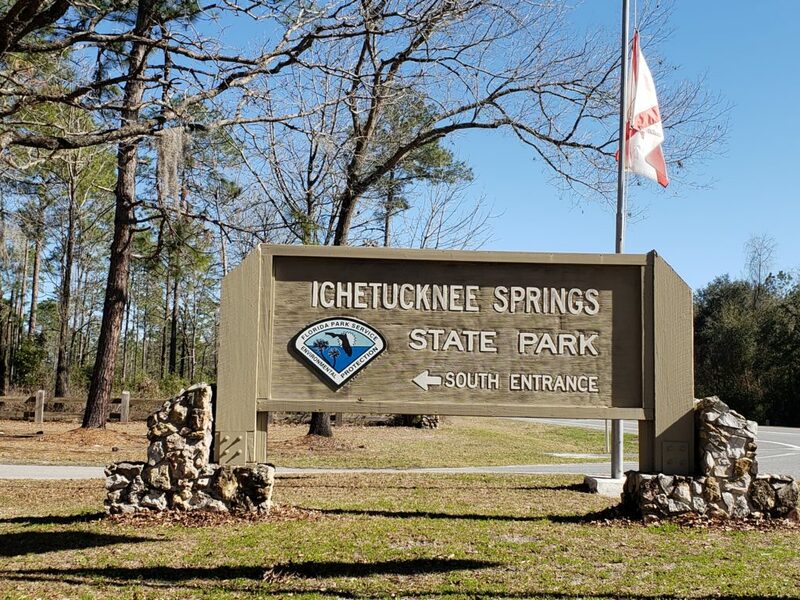 We arrived at Blue Spring State Park and found out that we were at the wrong park! The ranger told us that it happens quite often. 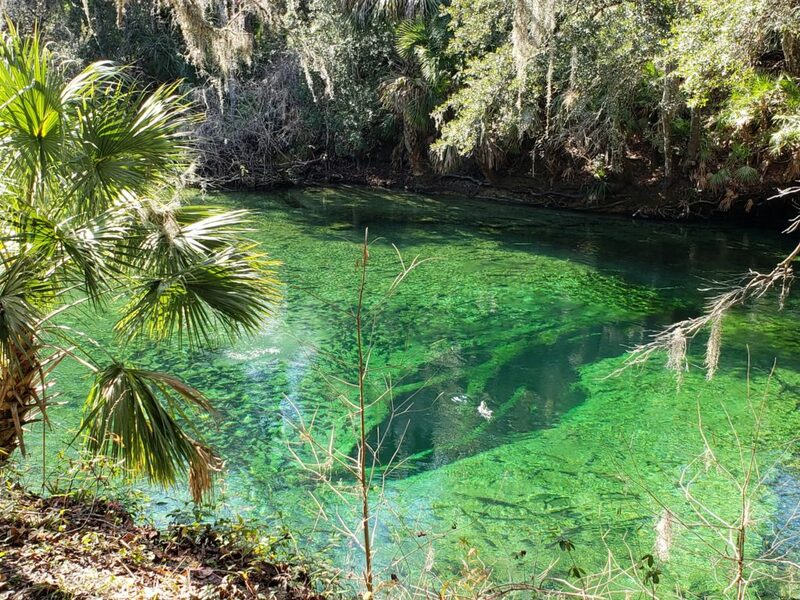 There are four FL state parks that have the words Blue Spring in them. 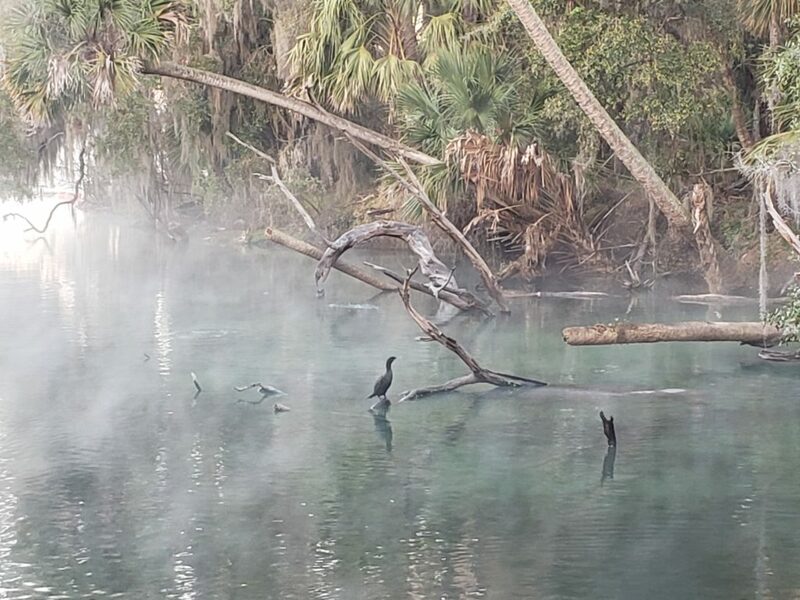 Luckily they had an opening for one night so we got to enjoy viewing the manatees in the 72 degree spring waters. We saw several manatees and had much better luck at viewing them the next morning rather than the afternoon we got there. Shortly after daylight, we went over to the viewing area and had the park pretty much to ourselves. It was a special time. We hope that you enjoy this family of manatees! What an awesome experience to watch them a they each came up for a breath of air! Next we will be heading southwest to get closer to the Gulf Coast. We will keep you posted on our fun trip! 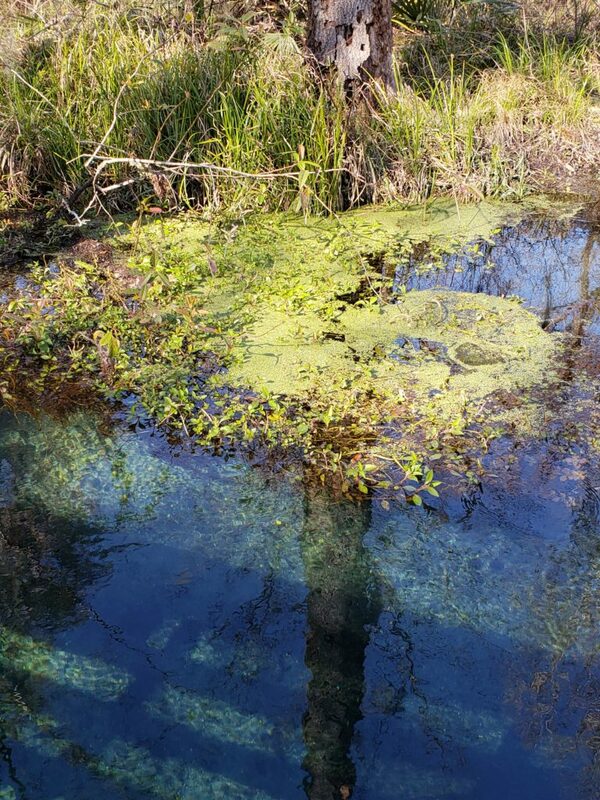 This entry was posted in Florida and tagged Ichetucknee SP, O'leno SP. Bookmark the permalink. Nice….loved the two short videos. What a great adventurous life style. Thanks Gordon, We love exploring and seeing new places! Thank you, Lisa. Looking forward to seeing you soon and having our own adventures! I’ve been to that Blue Spring park to see the manatees 3 different times! You indeed had a great opportunity to see a manatee family. Oh so you love the manatees too. Getting up early was the key to seeing the manatees and families. It was quiet and serene and the manatees were just lazing around. You would have loved it.